Nyeri women became ‘popular’ for chopping off their husband’s private parts or brutally beating them up but other women have their own way to deal with their husbands. 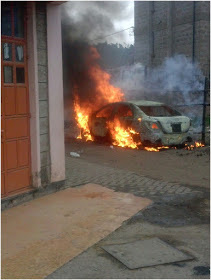 Recently, a jaded woman set her husband’s car on fire after she caught him cheating on her. The hideous ordeal took place at Rongai. 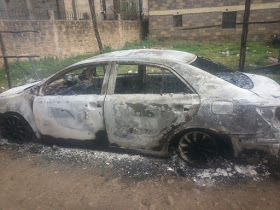 It is alleged that the infuriated woman followed her husband and when the ‘thirsty’ husband was ready to quench his thirst, hell broke loose, as the woman burnt his car that was parked outside the clandes house.